Vintage original 8 x 10 20 x 25 cm. Black-and-white single weight glossy silver gelatin print still photo, USA. Brigitte Helm, Alfred Abel, Gustav Frohlich, Rudolf Klein-Rogge, Fritz Rasp, Theodor Loos, Erwin Biswanger, dir: Fritz Lang, UFA. Originality highlighted this silent German-Expressionist film. The stunning special effects and design rival any of the state-of-the-art technical achievements of today. In the future, humans are divided into the two categories: thinkers and workers. Neither group understands the other, nor do they have a sense of fulfillment. A man, one of the thinkers, dares to venture into the land of the workers, and from that time there is great uprising. This father of all science fiction films is presently enjoying a renewed interest, with a stunning restoration including missing footage and a wild new musical accompaniment. 933-3A, released for the original American run through Paramount Pictures, the evil Maria incites the workers to riot. Crease at bottom left corner, tear to bottom right corner, tiny tear at blank white margin left side about 2 5 cm. Down from top and small edge tear near bottom right side blank white margin. It must come back in the same condition as it was sent. AUTHENTICATION: My name is Walter Reuben. I have been collecting movie posters since 1978. I have been a full-time dealer since 1982. Everything which I sell is fully researched and entirely guaranteed to be completely authentic and as described. A lifetime of experience goes behind every description of every piece which I offer. ABOUT ME: For further information, go to the ABOUT ME. 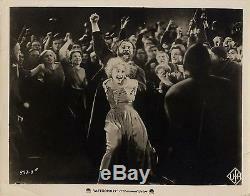 The item "METROPOLIS (1927) Vintage original 8x10 still #933-3A / evil Maria incites riot" is in sale since Tuesday, December 13, 2016. This item is in the category "Entertainment Memorabilia\Movie Memorabilia\Photographs\Pre-1940\Black & White". The seller is "walterfilmusa" and is located in Los Angeles, California. This item can be shipped worldwide.